How This Blog Makes Money! This week (early March 2019) marks the third year since I started blogging for money. I now earn a full time income from home with my blog. A few years ago, I had NO IDEA how blogs (or any websites for that matter) made money. I came across on an article on Pinterest at some point, where this woman was claiming “I made Pinterest my full time job!”, and I read it with serious interest (I mean, who wouldn’t!?). 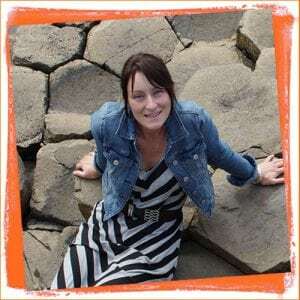 She said she started a blog and pinned her blog images to Pinterest, and people came from Pinterest to read her blog…and now she made thousands of dollars per month “working” from home. I tucked the information away in the back of my mind. I mean, it sounded AMAZING, but it also sounded like the definition of a pipe dream. The kind of thing that happens to someone else – but not to me. I got a job as a receptionist (making even less money), and I liked it well enough… but shortly after that I got pregnant. I just couldn’t imagine that I would have this baby and then have to hand it off to someone else day after day to go to work for so little money. Actually, almost no money – once child care was paid up. And over and over, that thing I had read about making Pinterest a full time job (by blogging) came back to me. So I decided to give the whole blogging thing a try – I mean, what did I have to lose!? I did some googling on how to start a blog and how to make money with a blog – and I stumbled on this blog course that just happened to be open for enrollment. There was a little countdown timer ticking – it was only open for enrollment for a few days… and it wouldn’t open again for a year. Everything I had read said that blogging was a LEARNING CURVE and it was clear the course wasn’t really for total newbies. Everything I read ALSO said that you should never start a blog just to make money… that was a sure way to fail! But, a nagging little voice in the back of my head told me that if I really wanted to do this, I should just commit and jump in, and let the money I had spent motivate me to work hard. I bought the course right before enrollment closed, and I dove head first into blogging – without any idea of how blogs actually make money. That blogging course happens to be opening up soon! 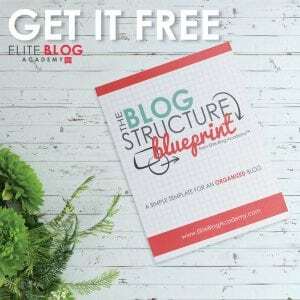 Elite Blog Academy – the course that I bought three years ago, generally only opens to the public once per year, but they will be secretly opening the doors at some point soon. Get on the wait list by clicking here to be notified when it opens! IT WAS HARD – and I mean, just the setting it all up part. (I was no where NEAR the money making part yet!) I kept running into things that just felt so so over my head. I would get so frustrated at times I had to just step away and take a break to breath… but I always went right back when I was calmed down, and sat there ’till I figured it out. And nine months into my blogging adventure, everything clicked, and I started earning more money than I had ever earned working outside of my home. When my son was born, in my blog’s 10th month, I hardly touched the computer for WEEKS – and the blog passively brought in over 4000$. First, understand that this is MY blog – I do not work for anyone or owe anyone anything. I am not accountable for my time to anyone else. If I want to take a week off, or even a month off, I do. If my baby keeps me up all night, and my husband is home for the day to watch her, I can go back to bed ’till noon. When my son has a fever and just wants to cuddle, that’s not a problem. My work happens on my schedule and that’s that. It is possibly the MOST AMAZING thing about being a blogger. The next best thing is my work can happen FROM anywhere. I can work from the doctors office waiting room, or from my bed at 2 am. I can work (someday, when the kids are older) from a beach in Hawaii. My earning potential also isn’t limited to the number of hours I can put in, and it isn’t based on the amount of education I have. I can grow and scale my earnings relatively easily (though it did take time to learn how to do that). The only thing you really have to “worry” about is that you follow the applicable laws and make sure you hire a good accountant to take care of your taxes. well, I’m sure you’ve noticed the ads. Either you don’t really think about them, or they irritate you. (You probably don’t LOVE them, haha.) But ads are the number one way this blog earns money. Irritating or not, they allow me to earn an income without asking my reader for a penny. Any time you click into one of my articles to read it, you see the ads, and the ad network pays me. There are pros and cons to using ads on your blog (the biggest pro being earning passive income, the biggest con being some readers don’t like them – among others). Once your blog reaches a certain size (in the amount of visitors it gets) you can apply to work with “better” ad networks. These networks pay far more than the beginner level networks – and ad income can become significant. Ad income can fluctuate wildly depending on the season, so while ad income is awesome, you don’t want to DEPEND on it to pay your mortgage. This blog earns an average of 3000$ per month in ad income alone. Affiliate marketing is when I talk about a product or service, and I link to it, then I can earn commissions on sales that result from the clicks. Say I mention a product on Amazon for instance – like, if I say “this is the baby bed we used for the first 4 months of my son’s life.” That clickable link (“this is the baby bed”) is a link to that product on Amazon. If someone clicks on that link, and then purchases the baby bed, I make a commission. It does not cost the buyer any more than it would normally cost. Amazon is giving me a cut of their profit for referring the buyer. There are many many affiliate programs out there, not just Amazon. The key is to find things to promote that are RELEVANT to your readers and to the things you are writing about. I write a lot about pregnancy and breastfeeding and postpartum, as well as home making and travel. I promote (as an affiliate) a prenatal class, a breastfeeding class, a postpartum healing and weight loss program, a home organization course, a travel agency etc. It is best if you only promote things that you genuinely like yourself. It’s much easier to earn an income if you are talking about things you have experience with. Promoting something just because it has a high pay out is generally a very bad way to try to earn with affiliate marketing. You likely won’t make many sales. This blog currently earns around 2000$ per month from affiliate marketing. While sponsored posts and brand partnerships are not a very big earner for THIS blog, some blogs make THOUSANDS with this type of work. It is, essentially, another type of advertising. This is when a brand pays you to write a post about their product. This will be disclosed at the top of the post (usually something like, “This post is a collaboration with nameofbrand. All opinions are my own“). I don’t do many sponsored posts because, to be frank, I don’t like them and I don’t think they are the best way to earn. They feel like “working for someone else” instead of working for yourself. I charge a rate of 1000$ for a sponsored post, which is quite high, because it is a better use of my time to write a post that I want to write that could earn 50-100$ per month for the next three years than it is to write one post that earns 200$ once. This blog only does 1 or 2 sponsored posts per year. Since learning to blog, I have also created a few small products that help others understand how to make money with a blog. This also brings me income. 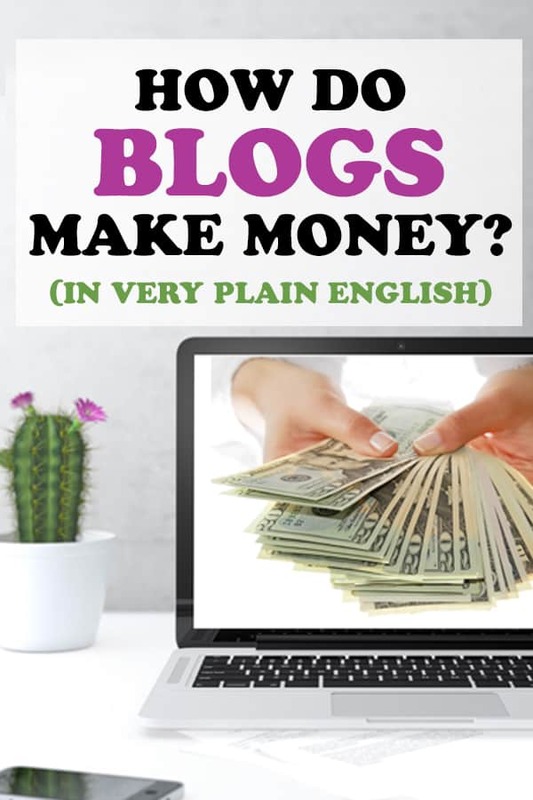 I don’t really consider products as a way that THIS blog earns money, because the products are in a different “niche” (subject) than the blog itself, but having the blog allowed me to branch into this income stream. There are many blogs, however, that DO sell products relevant to their subjects – and products are a HUGE income stream for some blogs. This blog does not sell services, but any blog could! 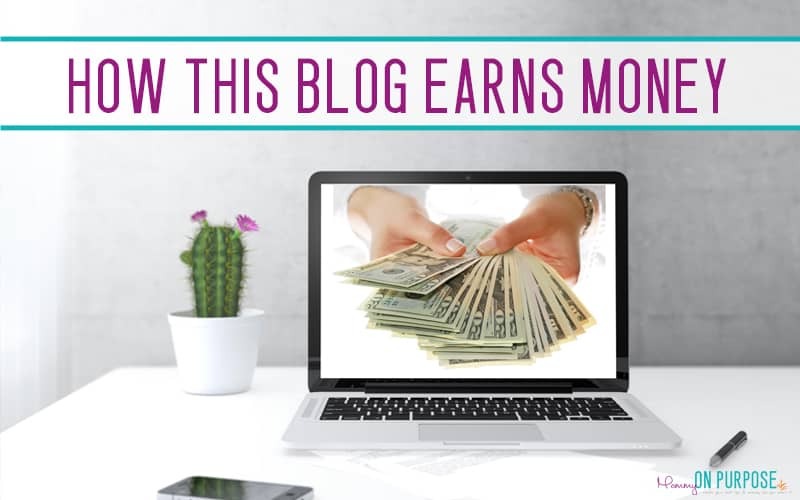 I just figured I’d mention this, since we are pretty deep into the topic of how blogs can earn money. The sky is the limit when you blog! Does earning a living with a blog sound like something YOU want to try? I am eternally grateful that I decided to go ahead and jump into blogging. I feel like God has lead me to this, and blessed my work. If you want to learn more about start a blog to make money, I have a free tutorial that walks you through the setting it up and explains some of the more tricky things in depth. You can access the free tutorial on starting a blog to make money by clicking here.